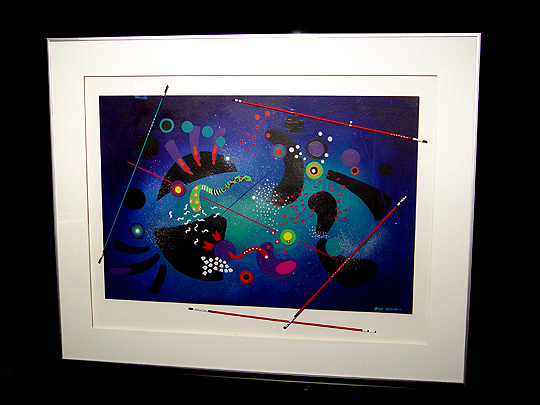 This work is a development of Bob's Rankinsky Series... whimsical, colorful, high-energy shapes against a dark background. However, this much larger work also includes a new element... three-dimensional sticks that are placed in front of and around the work. I think this is a really neat idea, and really makes this work stand out. The name Rankinsky's Pick-Up Sticks is a combination of the Rankinsky/Kandinsky pun and the name of the old game "Pick-Up Sticks" (in which you have to remove one stick from a pile without disturbing any other sticks).